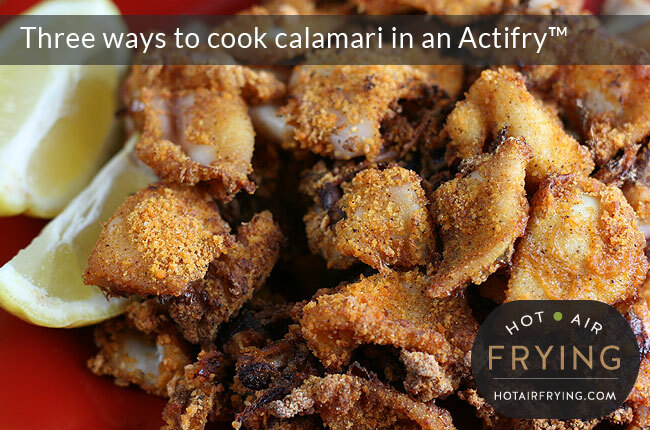 This post looks at three different ways to cook calamari in an Actifry: two coated, and one plain. 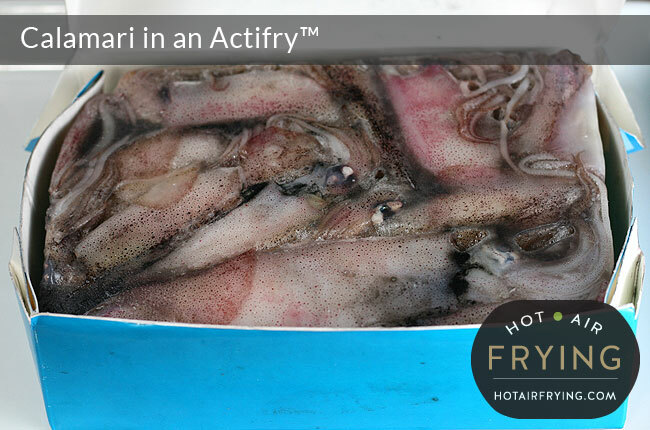 There were two x 1 kg (2.2 pound) boxes of calamari (aka squid) in the basement deep freezer for ever. 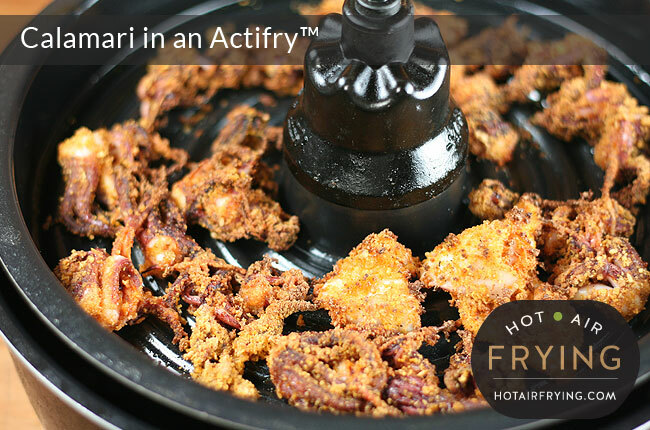 I wanted them out of there, and decided that because they’d been got on sale, it was as good a time as any to experiment some more with calamari in an Actifry™. If it turned out to be a disaster, I didn’t care — they’d been cheap, and I just wanted them gone. 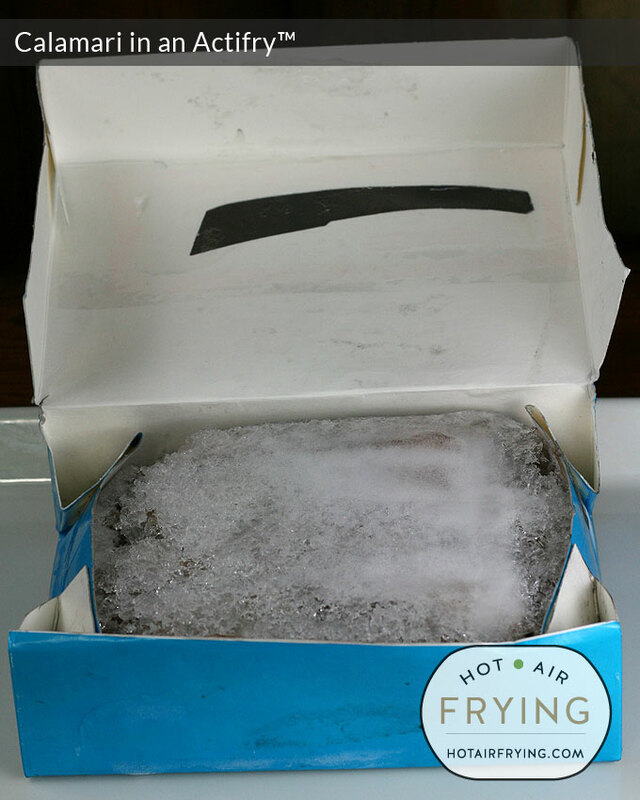 The boxes were quite iced up inside: I wasn’t surprised, they’d been in the freezer for quite some time, and even though it’s a proper deep freezer, icing up inside food packages still happens over time. These particular boxes didn’t even have any cellophane or anything in their windows at the top; they were just all cardboard. I’d put them in thick freezer baggies, but they still iced up, and at times when you were rootin’ around in the freezer, you sure still got a whiff of their fishy contents. But as the ice thawed away, I saw why they had been such an amazing price. Hello, who’s that staring at me? Lots of little eyes. Sigh. I saw the next two hours of my life pass before my eyes. They needed complete cleaning. But they were already thawed, so, onwards and upwards. 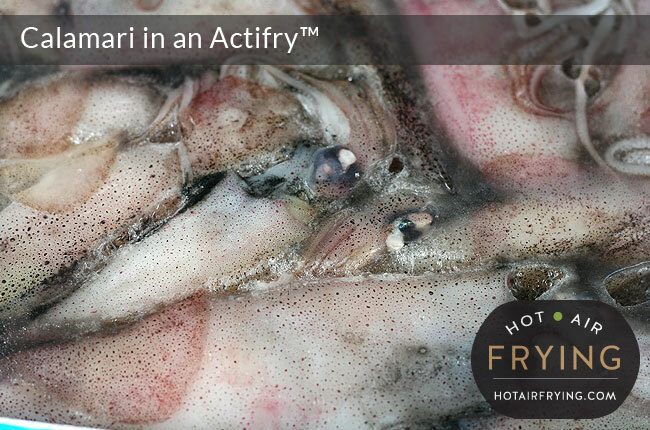 All in all, each kilo of frozen calamari yielded 350 g (12 oz) of “tubes”, and 100 g (3.5 oz) of tentacles. More than half of each 1 kg frozen box was ice or waste, and about an hour per box to clean. Which is to say: only buy this way if you don’t mind the time, and are not squeamish. 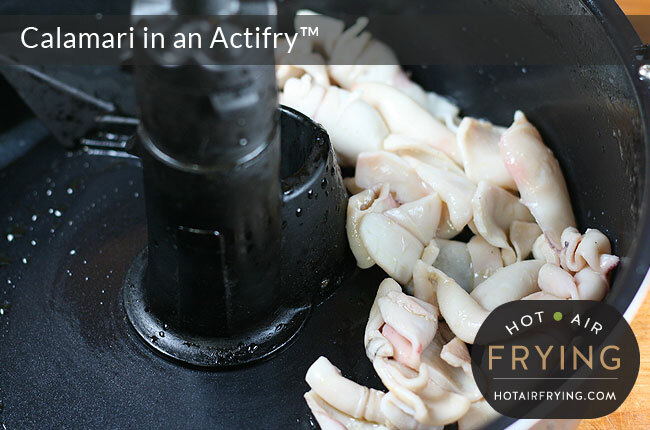 I wanted to see how the machine would handle cooking up some calamari for something like a seafood salad. 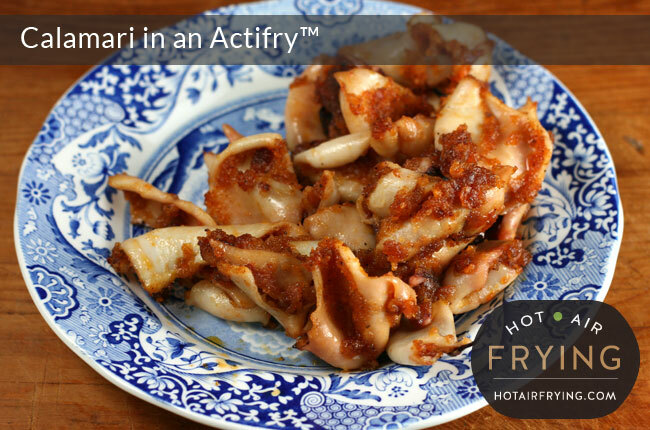 I chopped up some calamari tubes roughly, and put them in the pan with a tablespoon of olive oil and a few tablespoons of white vermouth. 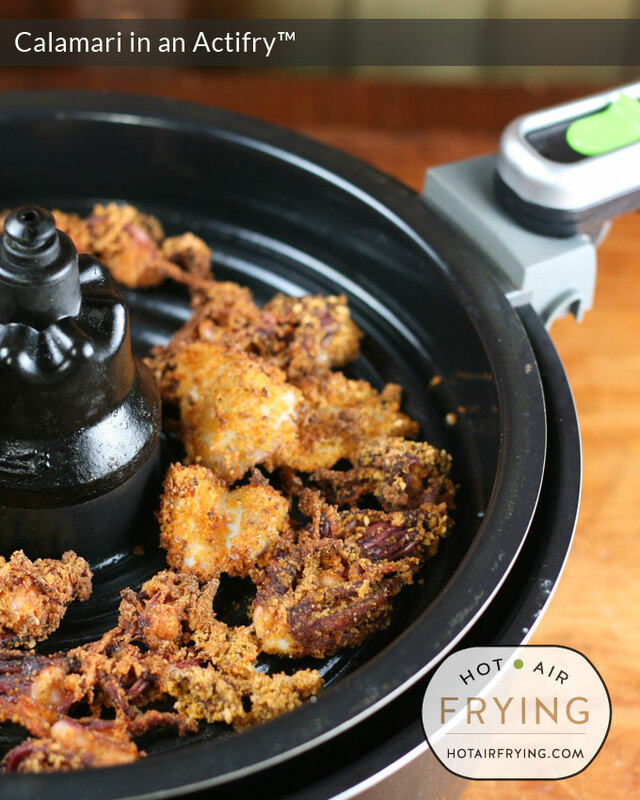 I heated the oil and vermouth up for 2 minutes before adding the calamari pieces, then cooked them for 10 minutes. The smell was divine, and the taste just as good. The texture was very soft. The only thing I would do differently is cut back on the quantity of oil: for the quantity you see in the photo above, 2 teaspoons of oil would have been plenty. 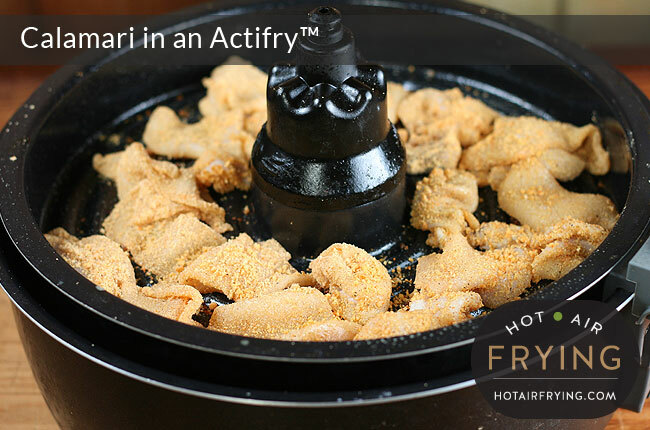 I’d seen in passing, here and there, recipes for coated items cooked in the Actifry pan with the paddle in. But, I’d always gone…. hmmmm? Screen capture from https://tfalactifry.com. August 2014. But I had my doubts — serious doubts — that any crumb coating was going to come out as perfect looking as the photo above after being tumbled around. We would see. There they are in the pan above, ready to go. I cooked for the 10 minutes that the recipe suggested. And you see the results above. I have to say, as I fully expected, they ended up in a bunch, with most of the coating ripped off. 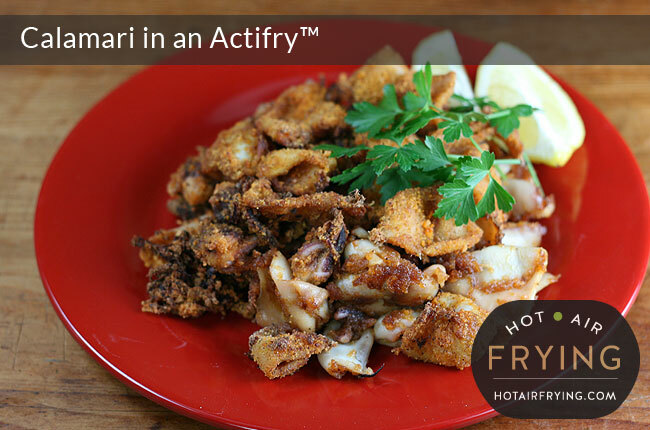 I need to also say I think that the 1 tablespoon of oil I put in was too much for that quantity of calamari pieces. Well, let’s plate them up and have a look at them anyway. Well, they’re not gonna win any beauty contests, are they? 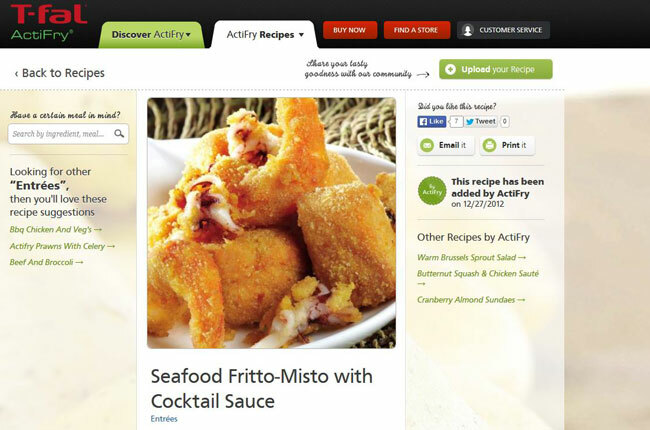 And they sure look mighty different from the food photography on the Tefal site. You almost want to wonder if that was just frozen pieces out of a supermarket box heated up in a toaster oven! Anyway, time for the taste test — OMG. Really good. Really really good. So tender, too. Amazing taste and texture. I was sure that the bread coating would survive better in the top tray. 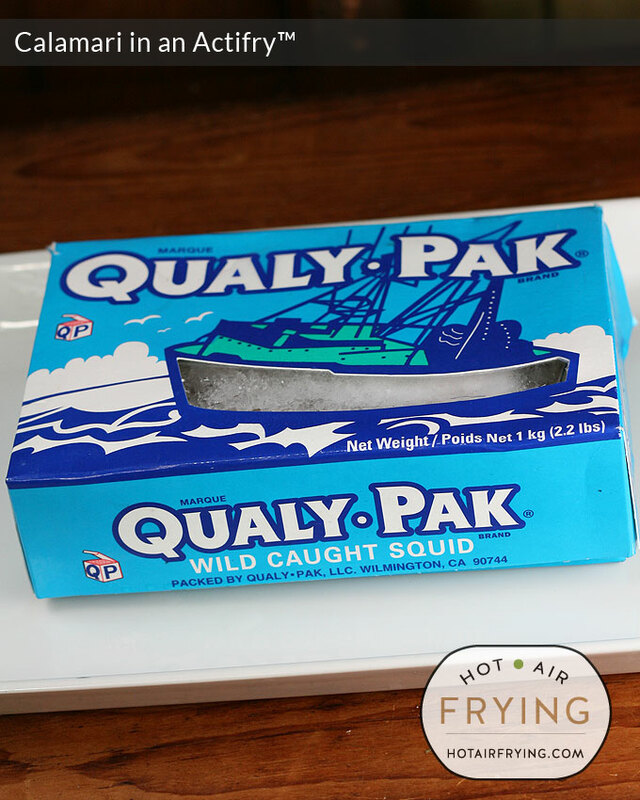 The question in my mind was more: would the top tray heat be too much and make the calamari dry and rubbery? I did two separate batches: one of mostly tentacles, and one of tube pieces. Both pan batches (methods 1 and 2) had had 10 minutes of cooking time, but these top tray batches were going to be extremely close to the hot air fan, so I reduced the cooking time to 8 minutes. That was a good, lucky guess on my part. In retrospect, I wouldn’t have given them any less or any more time. Oh, by the way, just before cooking each batch received an extremely light spray of cooking spray — and the bottom of the grill pan was sprayed, too. Above is a photo of the tentacles cooked up (with two stray pieces of tube in there.) Nice and crispy looking. 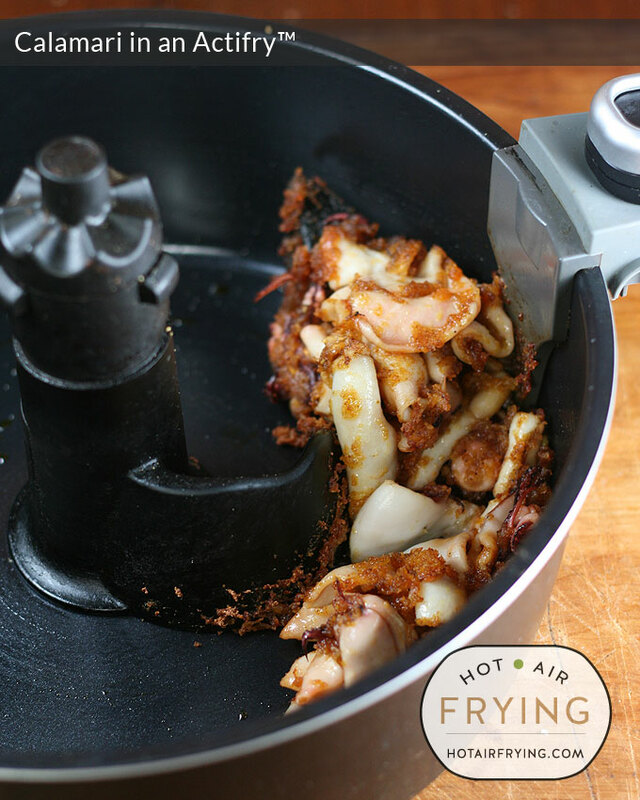 And there’s the cooked up calamari tube pieces — looking succulent and moist. Taste test? Absolutely fabulous. Incredibly moist, not dry at all, and it was mind blowing how tender they were. These look a lil better so they would present a lil better at a fancy do you were having. I won’t try to give nutritional info on the coating mix because the recipes for coatings all vary. 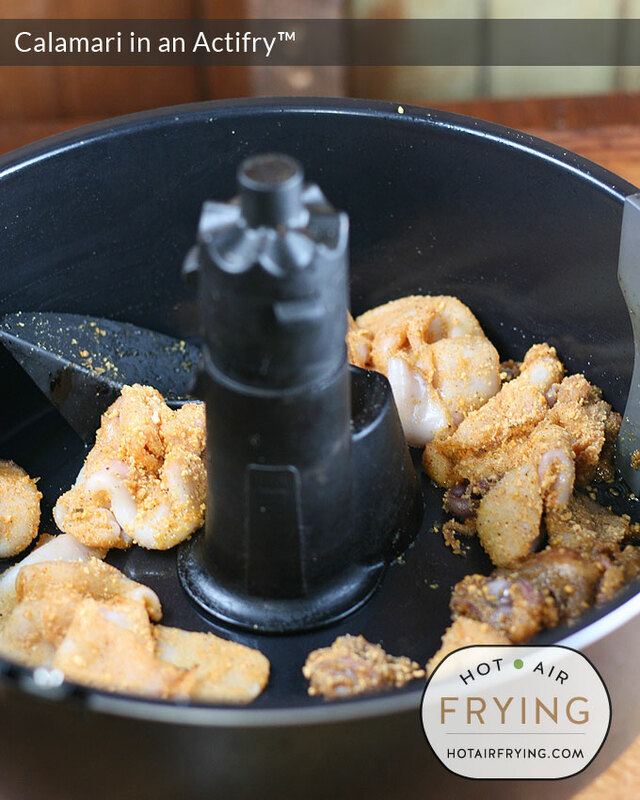 Have you tried frying breaded food, like calamari, without the paddle? 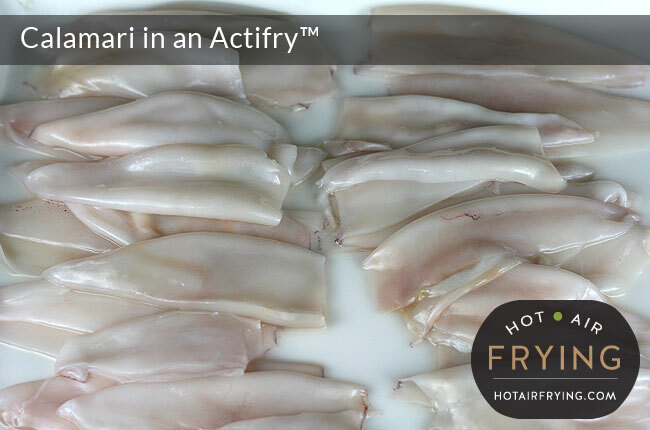 You will probably need to spray it with oil before frying and turn it halfway during the cooking process. I’ll let you know the result if I try it before you do. 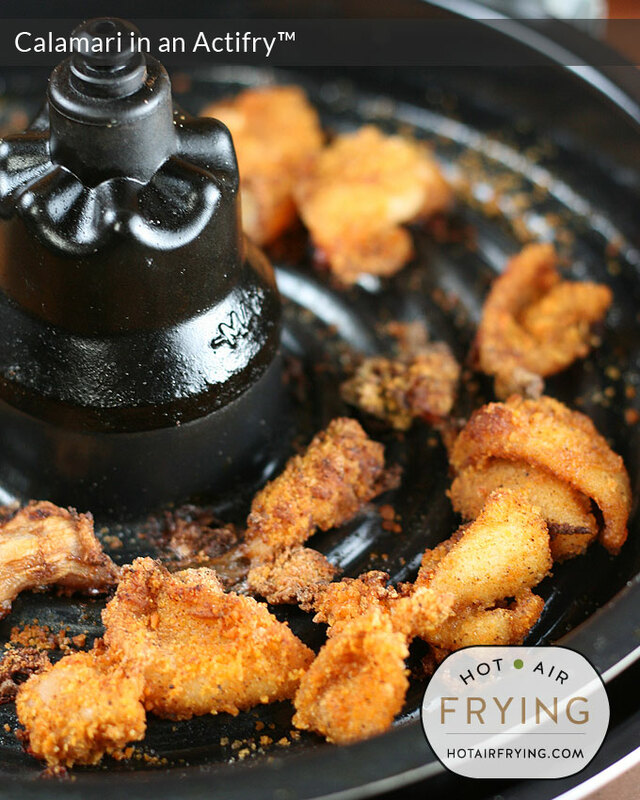 If you are doing it in an Actifry bowl, like, right inside the pan, yeah you definitely need to leave the paddle out. I know from sad experience, you just get a clumpy mess and everyone stares as you because you ruined their dinner lol. So totally with you on that. And yeah, like you, I would spray the pan or the calamari with oil, and turn the calamari pieces over a few times during cooking. Kindly provide the Temp. that these were fried at.